Flat and house-sharing is ever popular – particularly with an unsettled housing market and high rental costs. It’s not just students who choose to flat share, many people co-habit with groups of friends or strangers well into their 30s and beyond. The benefits can include cheaper rent, lower household costs for the individual and a sociable home atmosphere. If you own a house, you may choose to share it with others to help with mortgage payments and household bills. Negative points can include a lack of personal space, living with the potentially annoying habits of others and a reliance on other people financially. Regular payments are required from all parties to keep rent and bills up-to-date. Unfortunately, not all housemates are reliable with financial commitments. A good rule of thumb, if you didn’t buy it. Don’t eat it. If you do eat someone else’s food, come clean and don’t try to pretend it wasn’t you. Buy them a replacement. If you do buy a replacement, it’s a good idea to buy exactly the same product. If your ‘food victim’ has splashed out on some fancy organic rhubarb yoghurt and you buy them replacement economy strawberry, they might not be best pleased! Make a clear arrangement as to which foods are communal and how these will be replenished. For example, if you’re all sharing bread, milk, tea etc… perhaps start a weekly kitty specifically for these items. Be aware of the space in your fridge. If there are 4 people sharing a fridge, be considerate of how much you buy. If you fill up the fridge with lots of large items every week, no-one else will be able to fit anything in it. Try not to leave lots of your personal possessions lying about in communal areas. These can become very cluttered very quickly. If possible, keep as much as you can in your room. Sometimes, due to busy schedules, housemates can become ‘ships in the night’. You may go for weeks on end without having a proper conversation. Try to put time aside every month to have a communal meal/evening. This should help maintain happy relations and give people a chance to express any concerns. Be considerate about inviting friends and relatives to stay and check with your housemates first. Space is often fairly compromised anyway in share homes, so inviting your friend to stay on your couch for weeks on end could prove unpopular. Ensure bills are split fairly between all of you. It could be wise to set up a shared ‘house account.’ All housemates pay a set amount every month into the shared account to cover all rent and direct debits. That way, no one person is left paying a bill then having to chase everyone for their share. Security can be an issue in shared houses. With various people going in and out, windows can sometimes be left open or doors not fully secured. Not only could this result in the theft of your items, it could also invalidate any home insurance you have in place. All occupants should make an effort to secure the property fully when leaving. It may be tricky to get home contents insurance within a shared property. Often providers will refuse to cover you, as they see your living situation as having higher risk factors. There are policies available, but check all the terms and conditions that apply. Some providers may insist you have a lock on your bedroom door and may not cover items in a communal area. If you’re a student living away from home, you may be able to get a specialist student contents insurance policy. Before looking for a policy, check to see if your possessions are already covered under your parents’ home policy. Cleaning is a common gripe with communal living – so it’s really important that everyone pulls their weight. The obvious solution is a cleaning rota, but in my experience, this regimented way of designating and alternating tasks has never been very effective. Keep open communication between housemates and try to promote an ethos of cleaning communal areas after use. 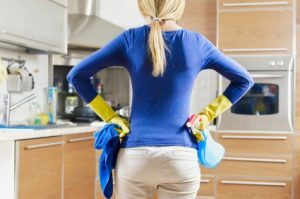 Perhaps put a few hours aside each week where all housemates muck in together to do a more thorough clean as a collective effort. As a general rule, washing up an item as soon as it has been used is the way forward. Otherwise, the dirty dishes just mount up and 1 person has a very big job. Build up a rapport with your landlord. If there’s a problem, be polite but also be firm in asking them to take action. It is the landlord’s job to make sure the house is in good condition and all the facilities are in order. Most landlords will respond quickly and efficiently, while others may take a little persistence on your part. Make sure your landlord fulfils all their necessary obligations– for example, regular gas safety checks and supplying working fire alarms at your property. Equally, you’re responsible for maintaining the condition of the property. If there is an issue, alert you landlord immediately before the problem escalates. The web has opened up many opportunities to find potential housemates in your area. One of the main sites people use is Spareroom.co.uk.